High summer! Heat and sun. Warm starry nights. The time of abundance. A time of freshly harvested salads with flowers and dungeness crab chased down with a cold cold slug of amber beer. A time for sailing dinghies and paddling kayaks. It is high summer and whatever one could wish a summer to be, this is the summer we have! I passed the US Sailing Association small boat sailing course with Camano Sail. Woohootie hoo! I learned much and proved once again that every time I am on the water, there are learning opportunities to be advantaged. I have been out on the water frolicking quite a lot in sun and wind this past month; I'm fast becoming a darker shade of white girl. And we've had a few close brushes with disaster too. On the water, a fun outing can quickly become problematic if the winds turn on you, or kick up above 25 knots. I'll address this a bit further down. With the garden in full force, outdoor grilling, a recent buddy boat trip with our pals George and Celeste on Nereid, a rambunctious young pup at my side, it seems life is good again. All this has me thinking about abundance and scarcity. How do these concepts shape my experience and perception of reality? One thing I sometimes feel is a scarcity of time. I seem too often to be hurrying around in an attempt to "git 'er done," making preparations for the next outing, or cleaning up after the last one. But there is enough time to do everything if I just slow down and do it. The slower I go the more time I seem to have. What irony! 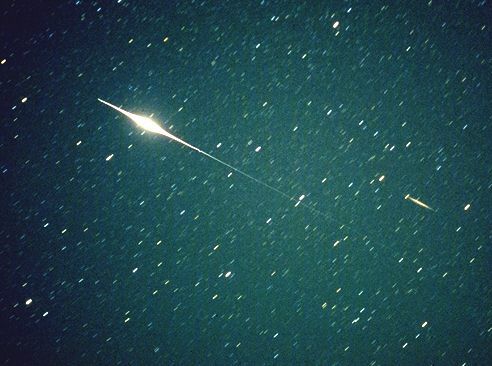 Take the twinkling of an iridium satellite flare that Steve pointed out one clear night. It required attention and patience to catch the shining little sky act. I was busy doing chores below when Steve interrupted and called me up on the deck for a show. He directed me to gaze, "about 50 degrees up and to the north... now watch... any minute now... keep watching... right there... any second..." I was about to lose interest when it happened, a star-like light appeared, brightened, traveled for a few seconds across the night and disappeared again to continue its orbit around the earth. It is amazing that we can know just where and when to catch the glint of sun off the solar panels of an orbiting satellite. It may be science and math that allow these satellites to be launched and to calculate their paths, but it is pure magic to see one appear in the night from the bow of a sailboat! Logic and romance touch for a moment in the still of night. In my rush, I barely savored the experience, but in retrospect I appreciate just how special that was. There is always time for moments like these. Take them when you can. There is an abundance of time... and infinity of it... eternity is the flip-side of linear time, and here is a tip from the mystics: it can be found deep within now. Abundance is only a state of mind, a certain framing of reality that colors our experience. She leaves contentment, generosity and camaraderie in her wake. Abundance is everywhere we bother to look. There is truly no reason any human should go hungry on this earth. When I see what 100 square feet of garden can grow, I know that this earth can provide an abundance for us all! 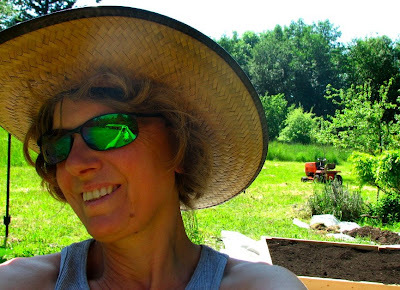 Around election time I posted an entry on Victory Gardens, and this spring I put my muscles into building one. Specifically, we spent $200 constructing and filling two 50 sq. 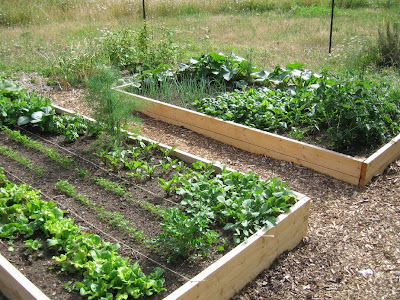 ft. raised beds with organic soil, compost and seed. We put up deer fencing, and planted a few starts. I don't think we have gotten our $200 back in produce yet, but there are more greens than we can eat and most of the cost will be spread out over the next few years. We have three varieties of lettuce, spinach, radish, beet, cucumber, beans, peas, tomatoes, dill, fennel, bok choi, cabbage, celery (yep!) carrots, garlic, Italian parsley, basil, peppers, rhubarb, zucchini, and yellow squash. Later we'll have winter spaghetti squash and brussels sprouts. Scarcity, the ugly stepchild of Abundance, begets deceit, mistrust, desperation and hoarding. The scarcity mentality is what makes us afraid to share, and afraid that others will take what we have. Scarcity mentality says there is not enough for all so get what you can, any way you can, and guard it from those without. Of course, we can all think of times when food or other necessities were in demand and scarce; it seemed there was not enough to go round. But if we were to zoom out a little and see a larger picture, there is always enough if only the "haves" will share with the "have nots." We can't give to everybody in need, but we can give to somebody in need--even if only a little. Like manic squirrels we stash away money and food, worrying that we will go hungry in the winter of our life, but disaster can strike at any point along the path and on any scale. Our reserves can be destroyed (from stock market plunges to power outages that cause freezers to fail) and leave us with little to nothing. It is just my humble opinion, but I do not trust that money will continue to hold its value, while friendship and good will can span even generations. A lot of friends will serve one better than a savings account. As some body's grandma used to say, "You can't eat money, honey." Understanding abundance means trusting that there is an ebb and flow to resources and trying to freeze the process doesn't help in the big picture, in the long run, in truth. Letting go keeps resources flowing. When we get rid of what we don't need we make room for what we do. Then there is Excess, the Dionysian cousin to Abundance, so arrogant and belligerent, who can be dangerous and harmful. We had a taste of this last Saturday when we were leaving our anchorage off the west side of Camano Island for the weekend and were surprised by an excess of wind. We planned a little over-nighter to Hope Island with our friends Suzanne and Bonnie aboard. Our trouble started with our efforts to get everybody, four people and two doggies, and all the gear dinghied out to Nomadness in the 15+ knots. I did the rowing for the three trips in ever increasing whitecaps and wind. Steve got knocked down by a cresting wave while trying to get in the dinghy--Bonnie got her foot caught doing the same and we nearly crashed into the bulkhead! Once we were all safely aboard, I slipped out of my soaking clothes and into a dry miniskirt and tank top. Finally the ordeal was over and we could take a breath before weighing anchor and sailing away. Wrong! Steve noticed the mooring buoys seemed to be getting nearer. Isn't the tide ebbing? Holy moly we might be dragging anchor toward the lee shore! I rushed to topsides so we could weigh anchor and get underway immediately. There would be time to collect myself and finish dressing once away from the shore. Wrong again! The wind quickly built to a steady 25 knots with upward gusts. Waves were crashing over bow and stern. Steve got about half of the 120' of chain up when the windlass brake failed and all 300' of chain paid out in noisy rush! Now we were in a serious situation. We were on a lee shore surrounded by small boats and buoys on a falling tide in less than 30' of water with winds increasing! The anchor chain was knotted and jammed in the locker so we couldn't even cut ourselves free if we wanted to. For the next half an hour or more we danced a delicate and scary waltz as we managed to get the anchor hauled in without getting tangled in the mooring field, stepping on any other boats, or going aground. I handled the helm while Steve wrestled the chain back in with the help of a bridle he cleated on deck to keep more chain from slipping out! Little by little he got it in. I should have known something would turn bad when Suzanne was nonchalantly whistling the theme to Gilligan's Island on the way to the boat. "A three hour tour. 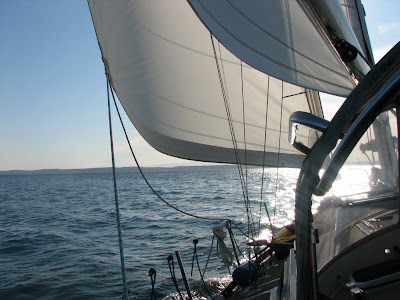 A three hour tour..."
We powered across Saratoga Passage toward Whidbey to get in the wind shadow and calmer waters to discuss our plans. The prediction was for south winds to 20, but we had west winds gusting over 30 knots which ruled out anchoring at Hope Island which lies just east of Deception Pass. After weighing all our options we ended up going into Oak Harbor with which we were familiar. We would be docking in 25+ gusts, but we had no other choice. With the windlass brake failing, anchoring anywhere was out of the question. Steve radioed the marina and was advised to avoid the harbor which was white-capped and busy. We revisited the alternatives and decided OH was our only option. He called the marina repeatedly for help on the dock but nobody answered. Apparently everybody was busy, but Steve insisted we had to go for it. Docking proved to be a tougher than usual ordeal. Steve managed to stay calm and pulled it off with some help from a favorable headwind and five magically appearing dock angels to muscle the 18 tonnes to a rest. What a day! What an education. I think we both gained some valuable confidence and trust in each other too. If you had asked me beforehand I never would have believed that I had the skills to pull that anchor dance off. I would have said I lacked experience. I would have had a scarcity mentality in regards to my abilities. But we did pull it off, we had enough knowledge and cool between us to do the right thing and avoid disaster. Steve proved to be a competent and calm skipper, and I did my job as crew (with nary a thought to my bare bottom flashing the houses on shore as my miniskirt flapped in the wind--whoopsy. I wish I had picture of that to post-hee hee!). So we drank wine and ate a delicious meal of corn on the cob, salad from my garden and crabcakes courtesy of Bonnie and her neighbor's gift of eight fresh crab. Summer abundance. We ended up sharing the crab and greens with a trio of brothers on neighboring, Mirador, our dock angels. Perfect. It looks like one way or another Steve and I are gaining the rapport that we will need to respond to the various situations nature throws at us out there. I wished for opportunities to learn lessons on the water, and I am getting them. Oh boy. Nomadness may still be only a couple miles from the homestead, but we are steadily on our way. Besides, what's the hurry? 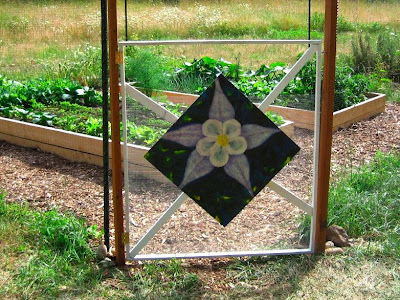 We have an abundance of time, a garden full of vegetables to enjoy, and starry nights punctuated with glistening satellites to marvel at as they tumble through our little slice of heaven. Now for those of you who would like to read a grittier, longer and much more detailed account of the lee shore emergency, please see Steve's exhilarating post! Whew! What a thoughtful and exciting read! I love all our insights on abundance and scarcity. Thank you for sharing them. You have such a gift, such a way with words, and for imparting wisdom. What a scary but thrilling cap at the end. You two make a wonderful team. Interesting read. 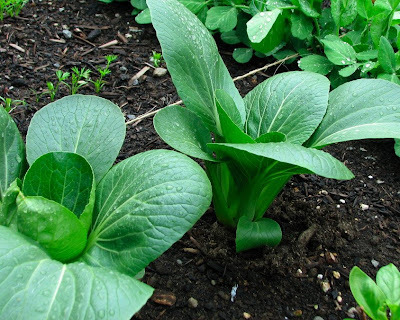 You might check out Steve Solomon "Gardening When it Counts" Have fun!